Join us Behind the Fin with Dave Taylor, formerly the Executive Director and later the Board President of Colorado Trout Unlimited. Read on to hear some of his thoughts on TU past, present, and future. I joined TU in the early 1980s, with the Boulder Flycaster Chapter, when I was in graduate school at CU. A few years later I became a life member. I moved to Colorado in 1980 and became a rather fanatical fly fisherman, so I began attending Boulder Flycaster meetings after reading their newsletter in the local fly shop. I quickly got conscript- ed by Bruce Hoagland to be the Newsletter Editor, and a couple years later became chapter president. I have done so many projects it is hard to determine a favorite. Certainly our work to save the South Platte from Two Forks inundation and our West Slope work to squash the AB Lateral project on the lower Gunnison are at the top of the list. Few today realize that we also purchased some key land along the Dream Stream section below Spinney Mountain Reservoir that helped maintain public access. We turned that final parcel of land over to the state to ensure permanent access and state property status. We did the same thing on a small piece of land on the Roaring Fork as well. Good stuff, indeed. You were a central piece of the fight against Two Forks. How did you overcome the odds and beat the ‘2000-pound gorilla’ that was Denver Water? I thought it was 10,000 pounds? And don’t forget the Metropolitan Water Providers! It was a tremendous cooperative effort between a large coalition of conservation and environmental groups. We also took a very intelligent approach. Thanks to agreements when Denver built its Foothills Project, we had a seat at the table for Two Forks. Technical experts such as Bob Weaver and EDF’s Dan Luecke helped build out a highly intelligent and viable series of alternatives that were cheaper, less destructive and could be phased in over time. We were able to point out several, ultimately fatal, flaws in the Two Forks proposal. It was a brave call by the EPA, but it was the right call. Many of the alternatives we proposed have actually been enacted, including conservation measures. No one in Colorado is without water to- day because Two Forks was vetoed. Intelligence prevailed. It’s nice to witness such a thing. Do you have a favorite place to fish or memorable fishing story? I have a lot of passion for the Madison River and the $3 Dollar Bridge area. Aesthetically, it is about as magnificent a river valley as you will see. The fishing is not bad either. It has gotten pretty crowded in recent years, though. Its recovery from whirling disease makes me particularly happy. You were at the heart of the battle over whirling disease in Colorado. What did it take to win that battle to reform Colorado’s stocking practices? Whirling disease was tragic in many ways, and personally was a very emotional issue. 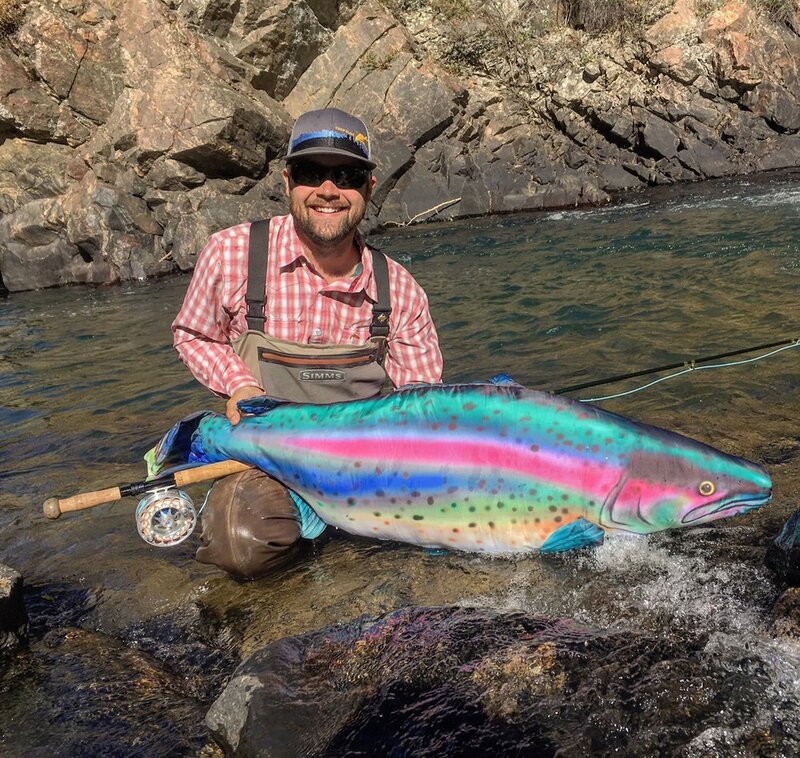 To see the magnificent wild rainbow populations collapse on the my favorite rivers – the Madison, the lower Gunnison, the Colorado in Middle Park, the South Platte and the upper Yellowstone and Yellowstone Lake – still pains me greatly to this day. We have learned much since the start of the WD dilemma, and some waters have recovered, but there is a clear and sobering lesson in WD for all of us to never forget. Catching some fantastic wild rainbows at $3 Dollar Bridge two years ago made me feel a lot better. But then I fished the Yellowstone near Sulphur Caldron last August and landed one fish. In early July of 1980 I hiked into Cub Creek, a feeder stream into Yellowstone Lake. The Cutts were spawning and were so thick in the stream it looked exactly like an Alaskan salmon run. For a kid from New Jersey it was magical to see -- the essence of nature and wild trout. Several years ago, I believe Cub Creek had less than 100 fish in its spawning run. I think tens of thousands were going up the creek in the early 1980s. The careless stocking of lake trout and the WD menace have put those Yellowstone cutthroat on the brink. It is a very sad tale. Forty years ago one could stand in Buffalo Ford on the Yellowstone River and 5 to 10 large cutts would move up into the wake created by your legs when wading. And they were all 100% native and wild. That’s why we need TU. TU has been a large part of my life, both professionally and asa volunteer. When I started inTU, I was one of the younger leaders, in my early 20s. I was a young Chapter President, and from 1986 to 1991 I worked for TU. Later I was chairman of the Natural Resource Council in my early 30s – younger than most other leadership members. I later became CTU President and helped Dave Nickum establish a foundation for what has been a great 20 run of success in CTU under his leadership. And I volunteered to help start the Western Water Project operation in Colorado. For the last 10 years I have not done much work with TU, other than donate to the auction and Century Club.I have been too busy with family and work. Now, almost 40 years after going to my first TU chapter meeting, I am 62 years old and no longer a youngster in TU. I have witnessed great friends and TUers such as Bruce Hoagland, Al Makkai, Leo Go- molchak and Fred Rasmussen pass away. While I don’t look at myself as old, I am no longer a young buck in TU. When I retire in a few years, I will get re engaged on the volunteer side. I have an affinity for skiing, golfing and biking, and also from a DIY perspective like to play with electronics and build hi-fi amplifiers and speakers. I discovered that there are too many great hobbies and sports to engage in in life. So I had to win now it down at several stages of life. What is the most important thing you learned from your past involvement with TU that present-day members ought to know? Conservation-minded anglers realize, and know, what we’ve got, and we need to band together and work our asses off to keep and protect it. If we want our grandkids and great-grandkids to be catching wild trout in magnificent settings and wading in clear, cold water, then we better work hard to protect the coldwater resource. If one doesn’t have time to personally dedicate to the cause, I can fully understand and empathize. But that’s when I say give money instead of time, so others can work on your behalf. It ultimately comes down to what something is worth to you, right?